Whether you are working with a group, studying alone, or watching a movie, the Library has a study room for you. Reservations for our groups study rooms are for 2 or more students. Groups can reserve any of the six group rooms and 2 people must check in to the library service desk to obtain room keys and in the room at all times. There should only be 1 booking during a time period. We do offer a space for individual bookings Room 215. Back-to-back and/or multiple reservations by a group are not allowed and may be cancelled by library staff if rooms are in high demand. 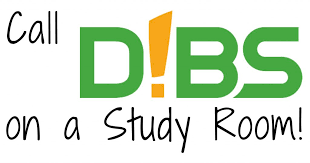 RESERVE A LIBRARY STUDY ROOM BY CLICKING ON D!BS! Once you've made your reservation, show your text or email confirmation to the staff at the Library Service Desk and our staff will check out a key for your study room. For group bookings, we require two students be present to check out the key. For more information, visit the Library Service Desk or call (925) 631-4229.